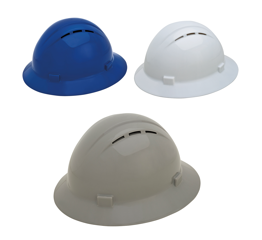 Short peak, slim profile Americana Series Hard Hats feature HDPE shells. The Full Brim option offers protection from the sun and the rain. Vents on the top of the hard hat helps to increase air circulation and keep your head cool and comfortable all day. The accessory slots accommodate a variety of safety accessories such as hearing protection devices, face shields, welding shields and chin straps. Goggle-retaining slots are included on the suspension. The moisture-wicking brow pads are removable, washable & replaceable. The Mega Ratchet secure-fit features an easy turn knob that allows size adjustment without removing the helmet. Each turn of the ratchet knob automatically lock with 50 meshing teeth securing the position. The no-slip hold maintains the desired fit even in the most physically active jobs or extreme weather conditions. The hinged ratchet fits low on the nape of the neck and is height-adjustable for a perfect fit. The ratchet mechanism is cushioned with a thick sponge padding for long-lasting comfort.